The storm Vaia caused considerable damages to the Italian forests, especially in the northeast of Italy. This area alone produces 2/3 of all Italian timber. Here, over 60% of the forests are PEFC certified for their sustainable management. The numbers are stunning. 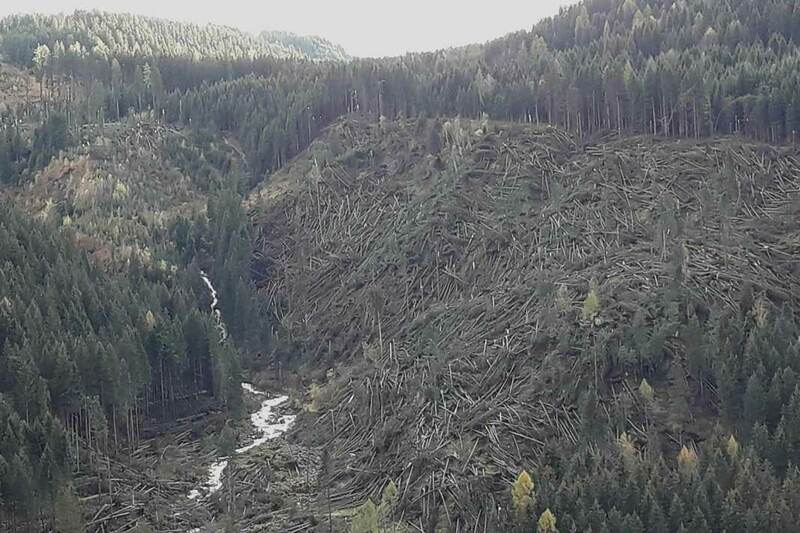 The strong sirocco wind, in just one day (29th of October) knocked down about eight million cubic meters of wood: the same amount harvested in an entire year of silvicultural activity in all Italy. Trentino Province alone has lost 1.5 million cubic meters; Alto Adige lost just slightly less than that, with similar losses in Veneto and in Friuli Venezia Giulia Region. Downed trees included not only spruces, but also firs and beech, depending on the area. The storm left hundreds of kilometers of forest roads to be restored. It is in this situation that PEFC Italy has decided to launch the PEFC “fair supply chain” project (“Filiera solidale”), asking the certified companies to purchase timber coming from these forest areas at a fair price, instead of importing timber (Italy imports 80% of timber). This activity will allow to develop and relaunch the national timber supply chain. This timber will be traced through the production chain, up to the final consumer and will be marked with a special logo. The forest owners wishing to join the project will ask PEFC Italy to use the “Filiera solidale” logo for the timber offered for sale. Minimum requirements are: a declaration stating that the sold timber comes from the destroyed forest area and the dimension of every single lot shall be smaller than 10,000 cubic meters of timber, in order not to create barriers to entry for small local businesses. The first buyers have to communicate the purchase to PEFC Italy, which authorizes them to use the “Filiera solidale” logo and to the Certification Body that will control the management of traceability. The processing companies of the next phase will continue to use the “Filiera solidale” logo on the basis of the wood purchases. The compliance will be audited by the Certification Bodies as part of the audits for the certification of Chain of Custody PEFC. Vaia showed once again that climate change is a real issue. Experts estimate that it will take 30 years to get the situation back into balance. The situation is serious, from an economic, environmental and social point of view. Now we need to learn the lesson from what happened and to keep in mind that the agreement between citizen and forest owners and managers may be working only if two fundamental conditions will be respected: adopting more sustainable lifestyles and increasing forest resilience.